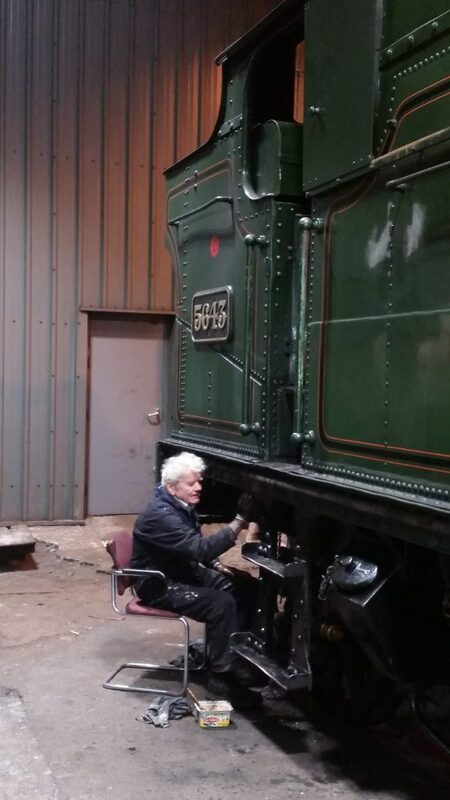 We start with the news that a milestone in the restoration of the FRT’s ‘Hall’ class 4-6-0 locomotive No. 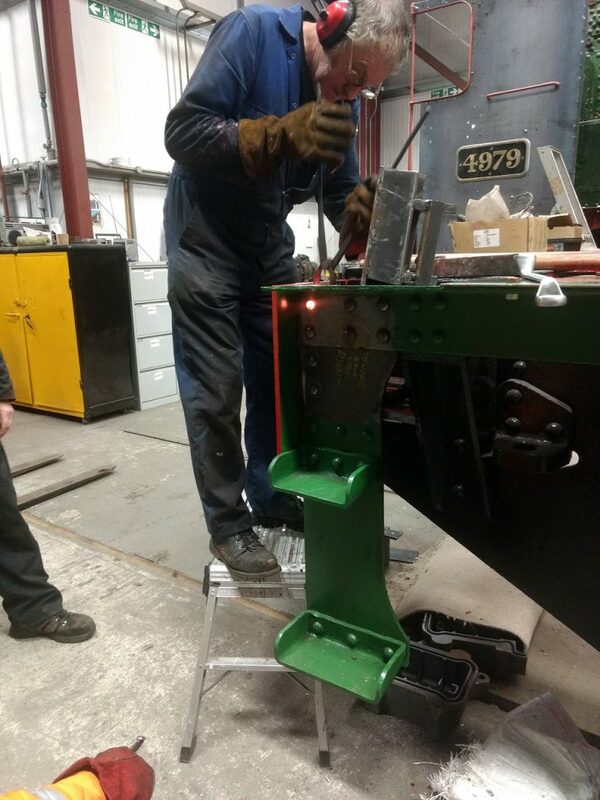 4979 Wootton Hall was reached on Thursday when the riveting gang fitted the last rivet to the re-built tender frames. The front of the tender frames had been severely wasted by years of water and coal dust which had cascaded down from the cab floor. 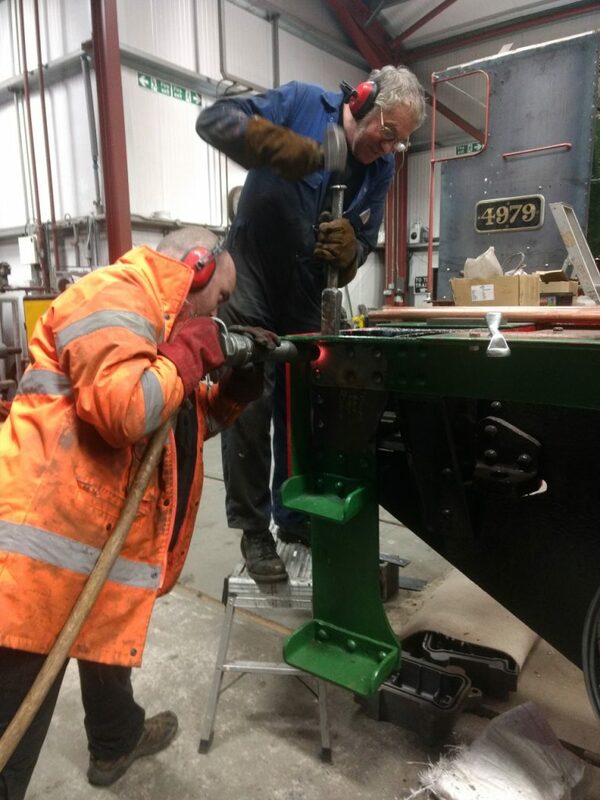 As followers of this blog will know, the riveting team of Matt Jervis, Keith Brewer, John Dixon and Chris Rycroft have been meeting regularly on Thursdays over the last few months and have been responsible for completing the fitting of several hundred rivets which have locked together the new steelwork with the old. The final day saw 30 rivets fitted, which is quite an effort! Well done to all! 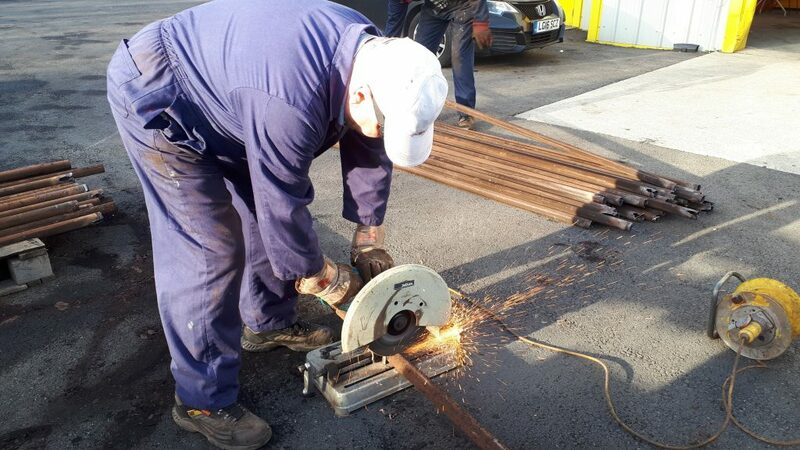 John is seen preparing the gas torch to heat up the rivets. 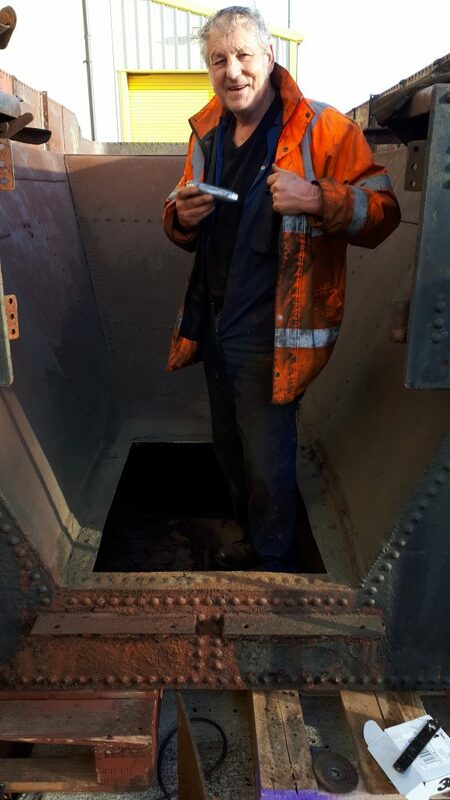 Keith is pictured holding the final hot rivet in place. And Matt Jervis applies the force to finish the job. 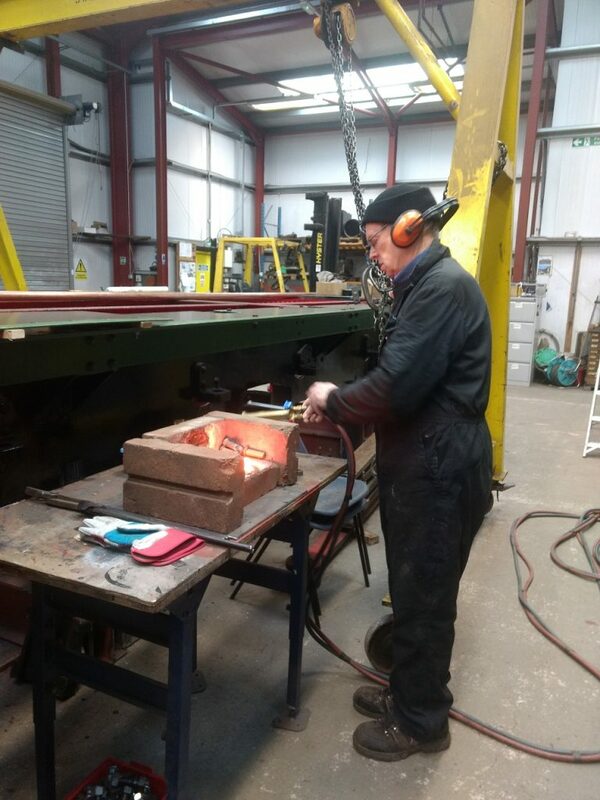 Staying with the Hall’s tender, and Alan Middleton is seen on Wednesday with the newly arrived second hand 4,000 gallon Collett tender tank recently arrived from Tyseley. As you will see here, it didn’t take long for Keith to set to with a cutting disc to remove the corroded shoveling plate. 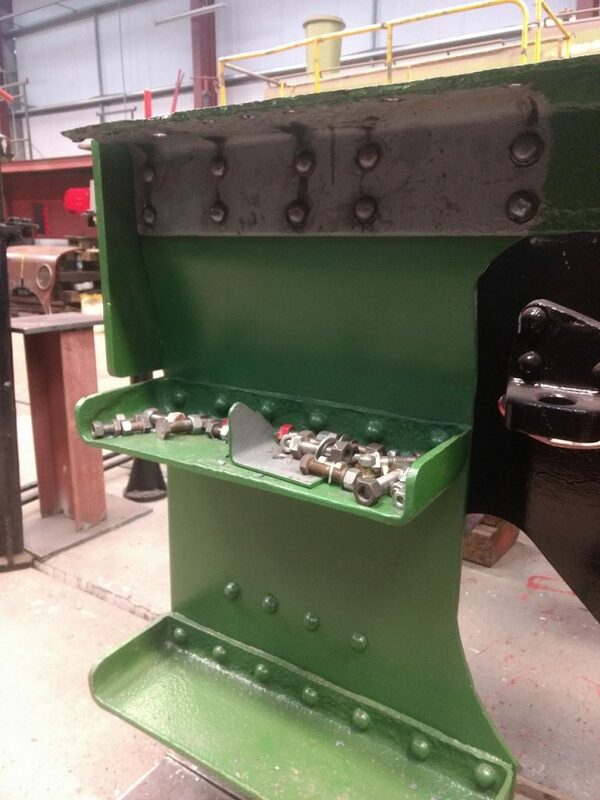 This will also enable scale to be removed from the tender tank. Onto other projects, and the axleboxes have been removed from FR 20’s tender wheelsets and cleaned. 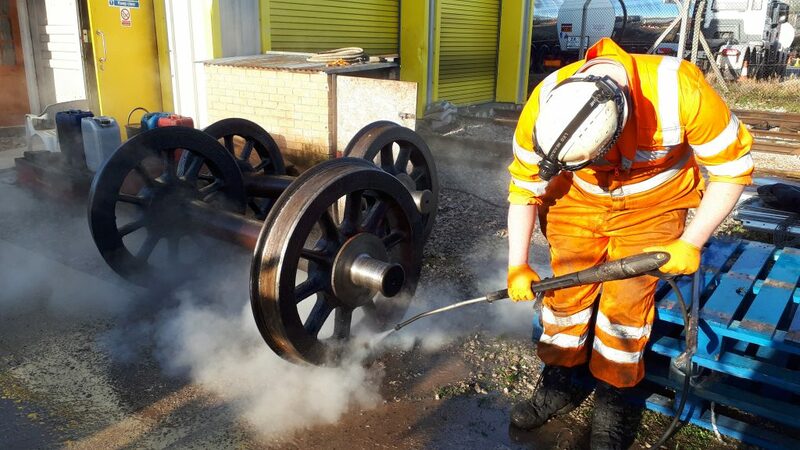 The wheelsets have received some attention from scrapers to remove twenty years of grime and the first set is seen here being steam cleaned by Matt Bedford. 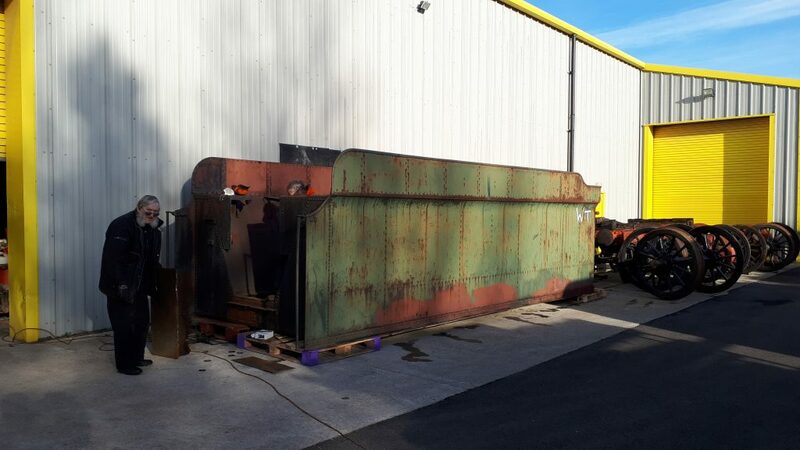 Andy Booth has completed the removal of the tubes from FR 20’s boiler and they were cut in half by John Davis before being placed in the scrap metal skip. There was a visit to Embsay on Saturday by Keith, Fred and Mike. Fred and Mike cleaned below the running plate on 5643 whilst Keith attacked the inside motion. 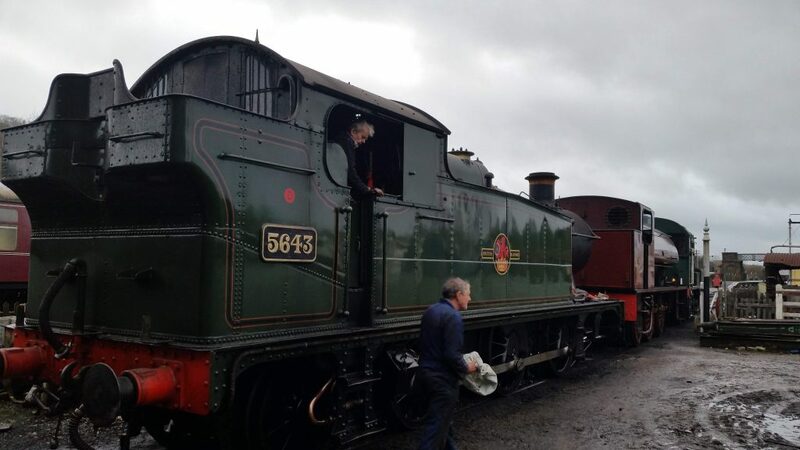 Both 5643 and Cumbria were drawn outside the shed to allow the water to be drained from the boilers and for Cumbria’s spare springs to be loaded. There was then time to polish up the bright work. Cumbria is due to arrive back at Preston today (Monday) to enable repairs and servicing to take place before it goes back out on hire. 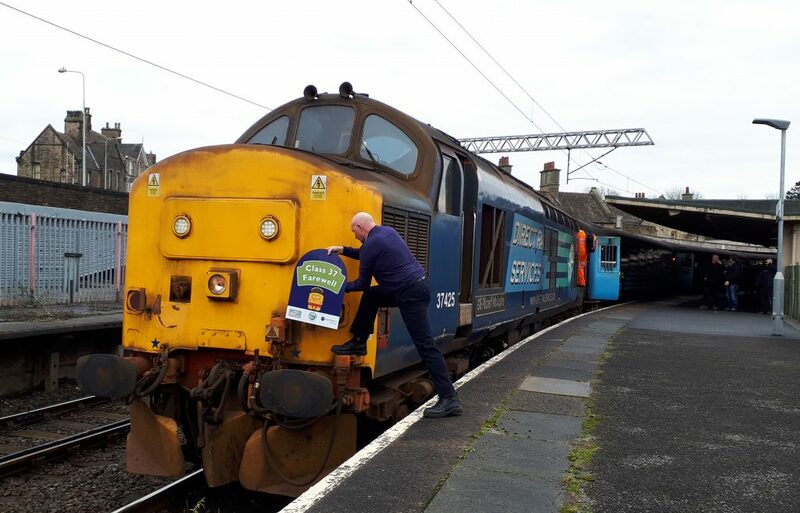 Finally, the trials and tribulations of the veteran Class 37 hauled services on the Furness and Cumbrian Coast Lines have been recorded here in past blogs. It is only fitting therefore that we leave you with a photo of the Class 37 Farewell Tour about to leave Carnforth on Friday on its return leg to Carlisle. This marked the end of regular loco-hauled services along the Cumbrian Coast. The Class 37 diagrams are now covered by Class 156 diesel multiple units, themselves now around thirty years old.